Yesterday was the second day of Google’s I/O event at the Moscone Center in San Francisco. For those of you that haven’t been following the event, announcements regarding Google Apps, Wave, and other web tools came out of the ‘Day 1 keynote‘. One the other hand, Day 2’s topic of focus was Android and Google TV. The event, which sold out 10 weeks earlier, had more than 5,000 attendees from 66 countries and over 200 speakers participating in over 100 technical sessions. That’s not counting the 25,000 YouTube viewers that joined the keynote’s live stream on just the first day. The event began with Vic Gundotra, Google’s VP of Engineering, taking the stage. His first point of topic? Apple backlash. He stated that a world without Android would mean “one man, one company, one device, and one carrier.” While directly referencing Steve Jobs, Apple, the iPhone, and AT&T, he touted Android as an open platform with choices, innovation, and options. Next, Gundotra went through an annual “Android Report Card.” Since the mobile operating system first made its debut 18 months ago, there have been 60 compatible handsets from 21 manufacturers in 48 countries for 59 carriers. 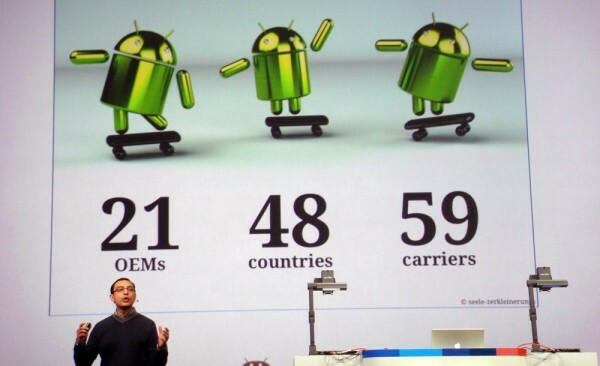 In February 2010, there were about 60,000 Android devices being activated each day. Today, Google now activates over 100,000 new units per day. As for Google’s Navigator, the application has offered over 1 billion miles of free voice-guided turn-by-turn directions in less than six months. Google’s mobile search traffic has grown by 500% since 2008. The Android Marketplace now offers a selection of over 50,000 applications created by over 180,000 developers. Gundotra then leaped into demos of the latest updates to the new mobile operating system. He stated that Google’s focus was on speed, efficiency, and automation. Just-In-Time (JIT) Compiler – 2x-5x speed improvements for applications on existing hardware. Enterprise Support – Support for Microsoft Exchange. Other features include Auto-Discovery, Security Policies, Remote Wipe, Global Address List lookups, or even Device Admin APIs. API Data Backup – While Android helps users take existing Apps to new devices, unfortunately the data within them wouldn’t transfer. Gundotra offered an example of his fitness App transferring over to his new phone without all the history moving with it. The new backup protocol allows exactly that to happen. Android Intent (Cloud-To-Device) – Allows pushing data to a mobile device from a Chrome browser. For example, if you don’t have time to finish reading a web page on your computer, the “Send To Phone” feature will automatically launch the browser and load the URL instantly on your Android device. The same happens for an address. Using the same sync feature automatically launches the navigation software and begins retrieving directions wirelessly. Tethering and Mobile Hotspot – Built-in support for portable hotspots for up to eight users. 3rd party developers can customize it, but don’t need to build it from scratch. Adobe Flash 10.1 and AIR – While Apple threw Flash out the door and embraced HTML5, Google believes in support for both. The next update will bring access to the “full web”. Search Improvements – Although Android has a decent search feature which has a scope of first party apps and the web, improvements are coming. The next iteration will offer plugs for developers to let users search within an Application’s data. Move Apps to SD Cards – Since internal storage doesn’t often offer enough space, users can now easily move Applications and data over to a microSD card. Marketplace Enhancements – Apps on the phone can now be set for “auto upgrade” when new versions are available. There’s also an “update all” feature which requires an action on the user’s part. A fully functional web version is available for access through desktop browsers. One-click from a web browser automatically “pushes” the newly selected app onto the select Android device. No tethering needed. Remote Music Library – Since storage space for mobile devices is limited, Google will begin to offer the option to stream content from a desktop computer. Using technology from their recent purchase of Simplify Media, content from iTunes or any other program will become accessible over the Internet to Android Froyo devices. Since Adsense and Adwords have been the largest source of income for Google, it is now stepping further into the mobile advertising realm. While some beta versions have been available for select developers, the program is now fully developed and open to everyone. The latest versions of mobile ads include options for text, image, and video content. With support for geo-location, the technology can also display locally relevant ads. It even tightly integrates into phone features by allowing users to place a call to a local business directly from an ad. New customers will receive a $100 promotion to get started with the program. Developers attending to Google I/O 2010 event paid between $400-500 to attend. Students, although hand-picked, were offered a special discounted price of $100. Each attendee was shipped either a Google Nexus or Motorola Droid a few weeks before the event. However, as a last-minute surprise, Google decided to give every attendee an unreleased EVO 4G handset in partnership with Sprint and HTC. Each device includes a month of free service and doesn’t have any contractual restrictions after this month is up. After an excellent presentation on Android, the audience was excited for Google TV. Unfortunately, Google caught the “Microsoft DEMO curse.” Just about every part of their presentation repeatedly faced issues due to slow networks, wireless network interference, and possibly bugs too. For starters, the service will come embedded into a Sony TV or as a standalone companion Logitech box later this year. The device will add an overlay on top of live TV to offer access to search features. The Android-based interface will also include access to the entire selection of applications from the Marketplace. Google is making tools available for developers to optimize their Apps to take advantage of the high resolution displays. Android handheld devices will also double as remote controls with voice enabled search capabilities. We’ve outlined more details about Google TV here. I finally had the chance to get the Google TV and it works great. I work over at DISH Network and that’s where I first used Google TV. I like that I can now watch TV and check my emails, or get on Face book while wresting is on. There is so much more to it and as apps are becoming avail it’s only going to get better. This has made life easier for me. I don’t have to go to different rooms to watch TV or get online. I suggest that everyone check it out.